Tatyana’s quiet existence is turned upside down with the arrival of the handsome and charismatic Onegin. Romantic fantasies burst into vivid reality, inspiring Tatyana’s famous letter, which Onegin arrogantly rejects. Years later, separated by time and circumstance, they are reunited for one final, explosive encounter. 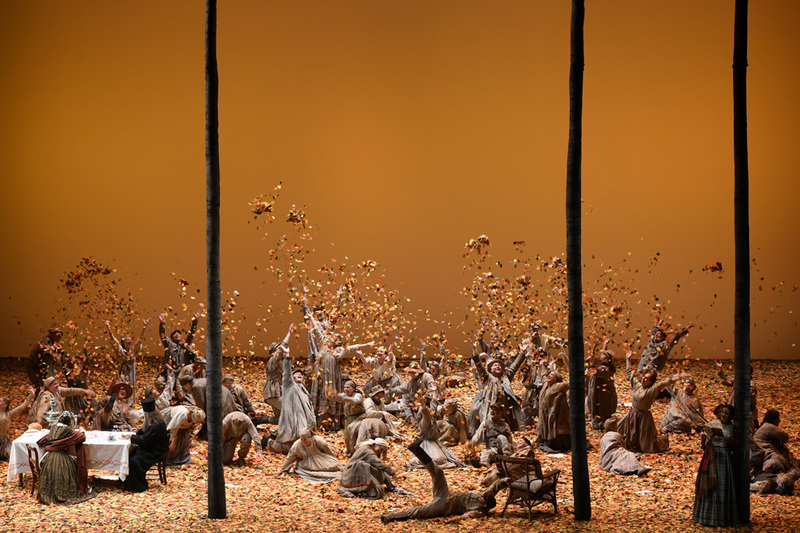 Acclaimed for its beauty and elegant simplicity, this production, originally created for the Metropolitan Opera, is directed by Robert Carsen and designed by Michael Levine, two Canadian visionaries of the opera stage. UNDER 30? Get your $22 tickets here. On stage at the Four Seasons Centre for the Performing Arts, 145 Queen St. W., Toronto. 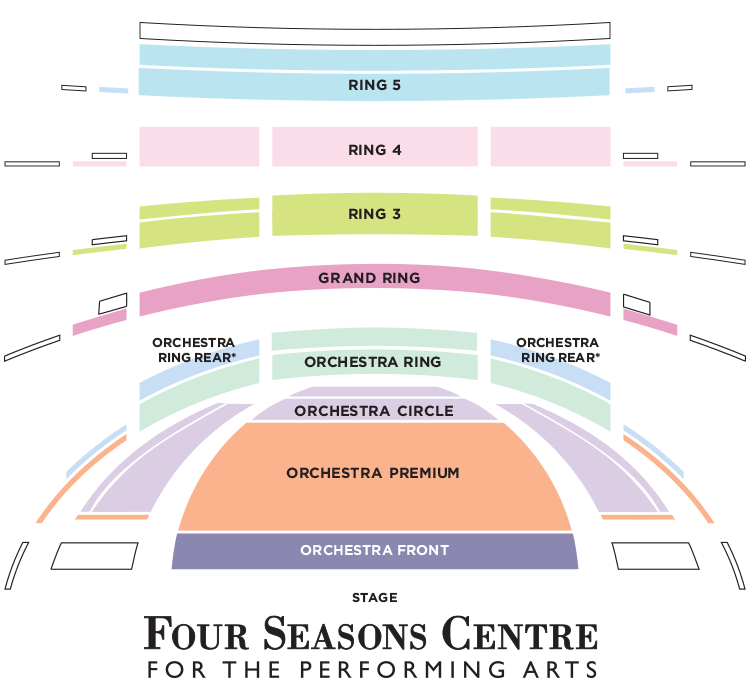 Performance time is approximately two hours and 50 minutes, including one intermission. Download the 2018 Fall House Program. Production premiered by the Metropolitan Opera in New York City on March 13, 1997. All scenery, properties and costumes constructed by the Metropolitan Opera Shops. In a deeply emotional letter, the young Tatyana declares her love to the proud Onegin, who rejects her. After killing his friend Lensky in a duel, Onegin travels the world to try and escape his regret. When he meets Tatyana years later, he realizes he loves her, but it is too late. Tatyana is now married and even though she still loves Onegin, it is her turn to reject him. At the Larin country estate, the widowed Madame Larina lives quietly with her two daughters, the vivacious Olga and the dreamy and reserved Tatyana. Lensky, a poet and Olga’s suitor, comes to visit and brings his new neighbor Onegin to meet the family. Tatyana is instantly struck by Onegin, believing him to be the one she has been waiting for. Tatyana cannot sleep and asks her old nurse Filipyevna to tell her about her own youth and marriage. 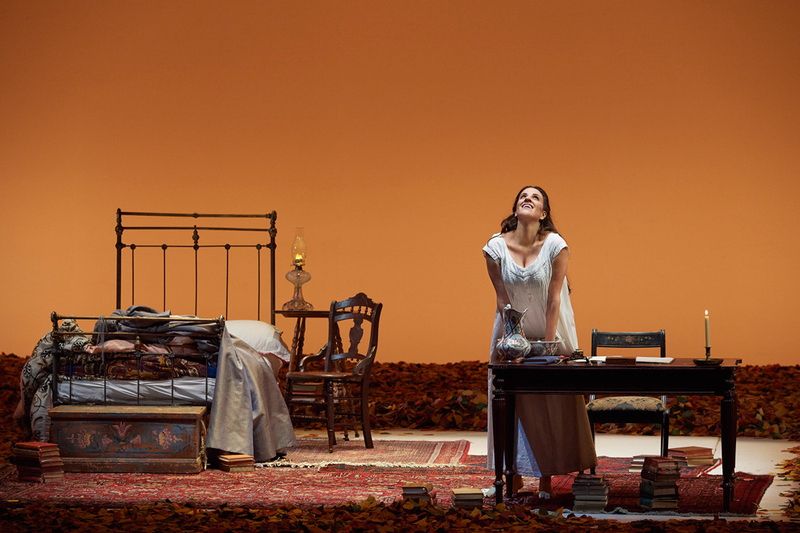 After dismissing Filpyevna, Tatyana pours out her overwhelming feelings in a letter for Onegin. As dawn breaks, she gives the letter to Filpyevna to have delivered. The women of the estate are picking fruit and singing. They move along and Tatyana enters, remorseful about her letter. Onegin enters. He tells her that while her candour has touched him, he is not meant for marriage—a union between them would only bring mutual unhappiness and misery. His love for her is like a brother, and he warns her to control her feelings in the future, as not all men might be so understanding. A ball is underway at the Larin estate to celebrate Tatyana’s name day. Neighbours gossip about Tatyana and Onegin; angered by this, and resenting Lensky for insisting that he attend, Onegin monopolizes Olga’s attention, which angers Lensky. Monsieur Triquet, the French master at a neighbour’s house, sings some verses that he has composed in honour of Tatyana. Lensky accuses Onegin of flirting with Olga and of being a disloyal friend. The argument escalates and Lensky challenges Onegin to a duel. It is barely dawn and Lensky and Zaretsky, his second, await Onegin at the site of the duel. Lensky sings of his lost innocence, his love for Olga, and his impending death. Onegin arrives with Monsieur Guillot, his second. As the men prepare to fight, they sing regretfully of their lost friendship. However the duel proceeds and Lensky falls, dead. Onegin is devastated. It is several years later and Onegin has been trying to escape his unhappiness with travel. Now he has returned to St. Petersburg and is attending a ball. Prince Gremin enters with Tatyana on his arm. Onegin asks the prince, a relation, who she is. The prince tells him that she is his wife—in old age he has found love. Prince Gremin presents Tatyana to Onegin. Onegin is stunned to recognize the same girl he scorned in the past is now a beautiful and cultured woman. Tatyana manages to hide her intense emotion at this reunion and complains of tiredness; she and her husband leave the ball. Onegin has written to Tatyana declaring his love. He arrives at her home and begs forgiveness from her. She reminds him of his treatment of her in the past and how happy they might have been. She begs him to leave; he refuses, passionately declaring his love for her. Tatyana admits to Onegin that she still loves him, but duty bids her to remain with her husband. She bids him farewell and leaves. Onegin is left alone, in despair. 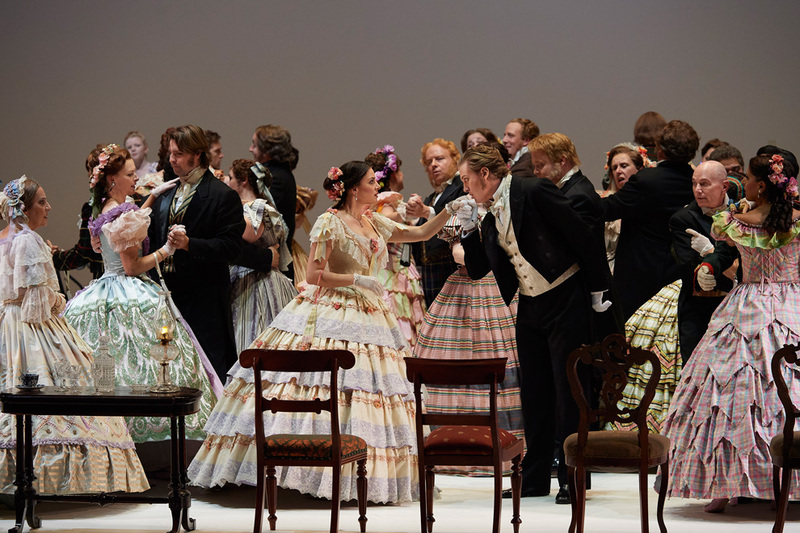 Production photos from Canadian Opera Company's production of Eugene Onegin, 2018. Photos 1, 2, 4: Michael Cooper; Photo 3: Gary Beechey. An excerpt from Prince Gremin's aria, featuring bass Oleg Tsibulko. Watch Joyce El-Khoury perform an excerpt from Tatyana's Letter Aria ("Puskai pogibnu ya") from Act I. Here is an excerpt from Act I featuring Gordon Bintner (Onegin), Joyce El-Khoury (Tatyana), Joseph Kaiser (Lensky), and Varduhi Abrahamyan (Olga). 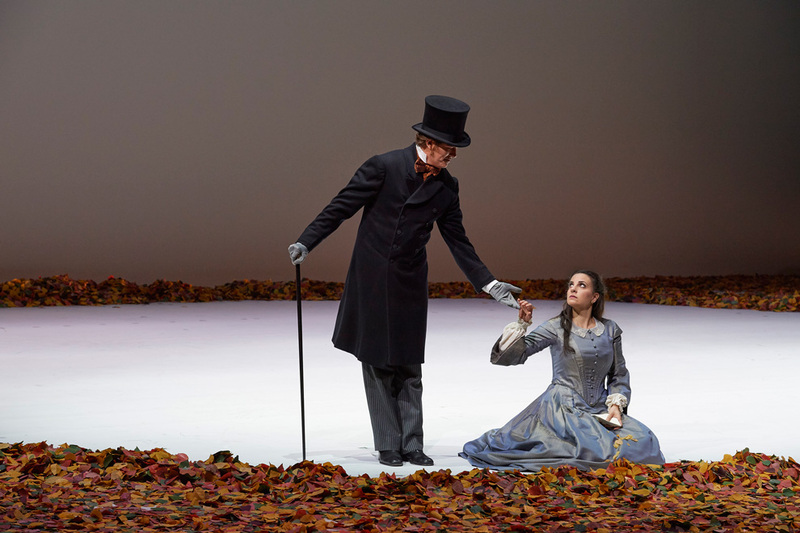 An excerpt from Act III featuring Gordon Bintner (Onegin) and Joyce El-Khoury (Tatyana). Ensemble Studio pianist & coach Stéphane Mayer gives you the rundown on what to listen for in Tchaikovsky's masterpiece, Eugene Onegin, including moving moments, impossibly catchy hooks, and all the great dance numbers. Tatyana remains awake all night composing a letter to Onegin in which she pours out her love for him. About to duel with Onegin, Lensky grieves for his lost youth, for the knowledge that one of them will die, and reminisces about his great love for Olga. At a ball in St. Petersburg, a polonaise is played. Banner photo features Dorian Cox (Program Manager, Free Concert Series), by Gaetz Photography. Could not retrieve performances at this time. Could not retrieve tickets at this time.